Have you ever noticed black spots moving around in front of your eyes? If so, you could have what are commonly known as floaters. You move your eyes to the side or turn your head and they disappear. They are annoying but you don’t think much about them as they do not affect your vision. You are able to ignore them, and, as time passes, you notice them less and less. If there are just a few floaters that are consistent or that you only see from time to time, they are generally harmless. However, there are certain situations where not seeking medical treatment can lead to permanent damage to your eyesight. For this reason, do not attempt to diagnose yourself or dismiss your floaters as inconsequential. Floaters, or myodesopsia, to give them their proper scientific name, are tiny pieces of collagen (a type of protein) in the eye’s gel-like fluid. This fluid, found at the back of the eye, is called the vitreous. When we are young, the vitreous is solid. But as we get older it becomes more watery, causing it to break down and form into clumps or strands. It is at this point that floaters may become problematic. These gel-like clumps can be many different shapes and sizes—little dots, wiggly strands or even resembling a cobweb. They begin moving around in the watery part of the vitreous, casting shadows on the retina. These shadows are what are known as floaters. Floaters can be more pronounced when looking at something white or bright. Such as a computer screen or a clear blue sky. When new floaters appear, there may be a flash of light which streaks across your field of vision. This happens when the vitreous momentarily pulls away from the retina. The flash of light will usually cease once the process is complete. At times, it can indicate a more serious problem. To be on the safe side, get an eye exam. The change in fluid consistency which leads to floaters can happen at any time. However, they more often occur in people between the ages of 50 and 75 years old. It is likely that almost everyone will experience floaters at some point in their lives. However, they can occur at a younger age. People with nearsightedness, those who have received an eye injury, have had past cataract operations, or who have diabetes are more susceptible to this condition. The shape of the eye can cause an increase in floaters. In people with myopia (nearsightedness) the eye is longer in length. This can lead to an increase in the number of changes happening to the vitreous. If the eye is damaged through an injury, bleeding can occur due to infection or a broken blood vessel. This is otherwise known as a vitreous hemorrhage. Any bleeding should be looked at by a doctor immediately. Do not delay if you bleed from the eye. Serious damage can occur if this is left unchecked. If you have an eye disease caused by an infection, it can lead swelling and/or inflammation. This can sometimes lead to changes in the vitreous. With diabetes, there is the chance of damage occurring to the blood vessels leading to the retina. If this happens, the retina struggles to interpret light and images correctly. Left untreated, diabetic retinopathy can lead to decreases in eyesight. As the vitreous breaks up it begins to pull on the retina. If there is too much stress when pulling, the retina can be torn in the process. This one is considered a medical emergency. On very rare occasions, the flashes that appear with floaters can indicate the more serious problem of retinal detachment. If the retina detaches itself completely from the eye, permanent and complete loss of vision can occur. For this reason, any flashes of light must be checked by an eye specialist immediately. Can one get rid of floaters? The majority of floaters are harmless and require no treatment. They will not disappear completely but they will usually fade with time. In many cases you will just stop noticing them. However, sometimes they can become very annoying. If so, there are some things you can try to get rid of them temporarily. Roll your eyes up, down, and side-to-side to try moving the debris from your field of vision. Moving your eyes shifts the fluid in your eyes, hopefully moving the debris too. If you experience floaters, it is best to get regular eye examinations. You doctor can begin to monitor them so they will notice if there is any increase in numbers. He/she will also check to make sure they are not caused by anything too serious. Floaters can be so large or there could be so many that they begin to have an impact on your vision. In these cases, further treatment can be sought. Though, unfortunately, there are very few treatments available at this time. During an eye exam, your eye doctor will be able to diagnose floaters. Using eye drops, they will dilate the pupils giving a better view of the retina and the vitreous. The doctor is then able to check for any damage to the retina. Eye drops may help in some situations by keeping the eye lubricated. One of the treatments available for severe cases is a surgery called a vitrectomy. During the operation, the vitreous is removed from the eye and replaced with a salt solution. This helps maintain the eyes natural shape. A vitrectomy is considered a high-risk procedure and can lead to further complications with the eye. It is also not guaranteed to remove all of the floaters and may not stop new ones from appearing in the future. Because of this, a vitrectomy will only be recommended in extreme cases. Laser treatments are becoming increasingly popular but they are not suitable in all cases. Your eye specialist will advise you on which treatment option is best for you. If you notice several new floaters, experience light flashes or a change in your peripheral vision, seek medical help immediately. 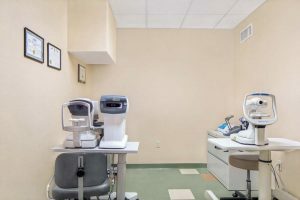 Book an appointment at the New Jersey Eye Center as soon as possible. Short Description: Have you ever noticed black spots moving around in front of your eyes? If so, you could have what are commonly known as floaters. Floaters, or myodesopsia, to give them their proper scientific name, are tiny pieces of collagen (a type of protein) in the eye’s gel-like fluid. This fluid, found at the back of the eye, is called the vitreous. When we are young, the vitreous is solid. But as we get older it becomes more watery, causing it to break down and form into clumps or strands. It is at this point that floaters may become problematic. If you notice several new floaters, experience light flashes or a change in your peripheral vision, seek medical help immediately. Book an appointment at the New Jersey Eye Center as soon as possible.